George Usevich, Norwood High School principal, shows how an intrusion key such as he is holding can keep intruders locked out of a classroom, but the class is never locked in. Massachusetts schools have new guidance on security from a state report out this summer that recommended monitored entrances, classroom door locks, and other security measures, but money is scarce to retrofit existing buildings, local school officials say. That’s why many schools in the Boston suburbs lack the security features of newer schools. For example, unlike the new Norwood High School, which opened in 2011, the previous school’s exterior doors were easily left ajar, principal George Usevich told the Globe. Students would walk outside to get to classes on the other side of the building. “It was just wide open,” he said. Schools built after the mass shootings at Virginia Tech in 2007 or Sandy Hook Elementary School in Newtown, Conn., in 2012 often have the best physical security features. And schools now being planned, like one in Swampscott that will consolidate three elementary schools, are looking at the latest technology to see what makes sense and what they can afford. The new Natick High School, which opened a few months before the Newtown shooting, has the capability to broadcast emergency messages, at the push of a button, on television screens throughout the school, according to Tim Luff, director of student services. Despite new recommendations from the state, money is scarce to retrofit existing buildings, local school officials say. Some security measures have become fairly standard for new buildings: key cards for staff, security cameras, and buzz-in systems at the main door. They are not, however, universal. Nationally, 88 percent of public schools and 80 percent of private schools control access to the building during school hours with locked or monitored doors, according to US Department of Education statistics for the 2011-2012 school year. Fewer use security cameras — 64 percent of public schools, 41 percent of private. Natick has both. It also has panic buttons that automatically alert police and lock down the school. In addition, each classroom has a “go kit” containing crisis response information, an item recommended in the recent report of the state’s Task Force on School Safety and Security. Natick High also conducts lockdown drills and staff training, he said. And although the town’s other schools do not yet have a direct line to the police department, the district is working on a direct radio link for each school. “I think, truly, everybody is on the side of our kids and ensuring their safety,” he said. In Norwood, unsecured doors at the former high school have been transformed into a controlled-access system, with a secure-entry vestibule from which visitors must be buzzed into the main building. Entry doors lock automatically, based on the time of day, and the school has more than 100 security cameras. Usevich said classrooms are equipped with hidden “intrusion keys” so teachers can lock doors from the inside during an emergency. Students who have senior privileges, who once ate lunch outside, now eat in an open-air courtyard in the center of the building, eliminating a weak point in the armor. “I don’t think any school, any community, any venue, is immune,” he said. At Lawrence High, where about 3,000 students are divided into six specialized schools, the building has about 300 security cameras; the city’s other school buildings have a combined 200 or so, according to Christopher Markuns, a spokesman for the school district. 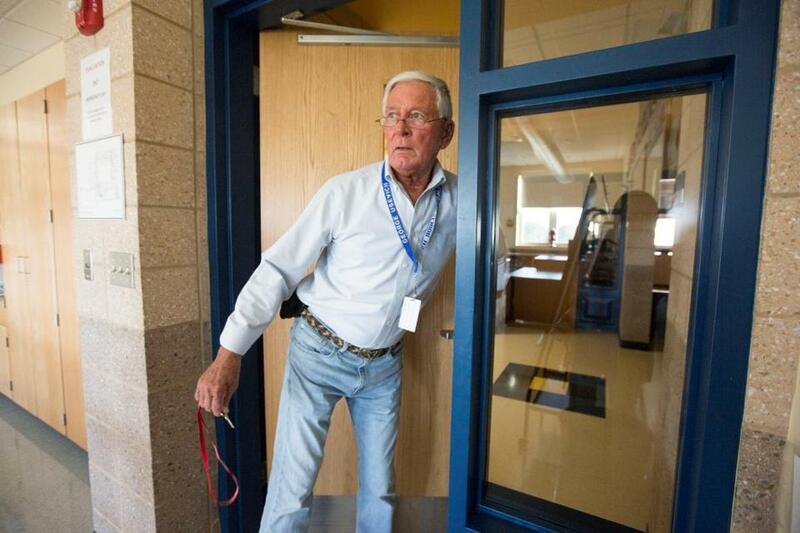 Last year, Lawrence finished installing buzz-in entry systems at all the schools, he said. Thirty-nine unarmed safety officers work in the schools, and this year, for the first time, they provide regular coverage of prekindergarten and kindergarten buildings. The district also has three full-time Lawrence police officers, plus one half-time officer, who are based at the high school and visit other schools as needed, he said. Matthew Malone, Massachusetts secretary of education, has seen myriad security tactics in his time in the field. 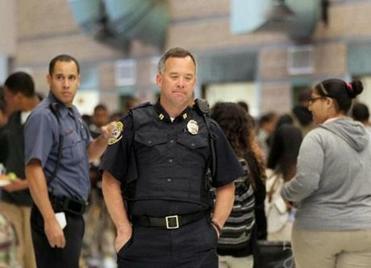 Schools in Brockton, where he served as superintendent until last year, have their own police unit. In Tisbury on Martha’s Vineyard, teachers wear panic buttons around their necks that go directly to 911, he said, and Nantucket has a door-lock system with a magnetic strip on each door that holds the latch in the open position. All the teacher has to do is pull off the strip and the door is automatically locked. “And then you go to other communities, and they don’t even have doors that lock,” he said. Yet one thing Malone wants communities to understand is that security involves far more than hardware. Too often, he said, offices and agencies do not communicate well, or fire and emergency medical personnel get left out of security plans. He and two other members of Governor Deval Patrick’s Cabinet, the secretaries of health and human services and public safety, cochaired the school security task force. “The number one recommendation and takeaway in this report is free: working across silos” — meaning, cooperation between agencies, Malone said. Practice is free, too. Whatever a school’s crisis response, it must be practiced in drills, he said. The report recommends that active-shooter trainings for first responders take place in schools, when students are not present. It calls for schools to employ at least one school psychologist for every 700 students, use a single set of emergency protocols, and offer an anonymous system for reporting threats, modeled after Brockton’s text-a-tip program or Speak Up, a national hotline for school violence tips (1-866-SPEAK-UP, www.speakup.com). For buildings, the report asks districts to use a set of principles known as Crime Prevention Through Environmental Design, one of which — called natural surveillance — suggests that crime can be reduced by designing physical features, such as doors, windows, walkways, and landscaping, in a way that makes people as visible as possible. Joe Crimmins, chairman of the School Building Committee in Swampscott, said the district may hire a specialized security consultant and hopes to take advantage of the latest technology, including cameras, controlled locks, key cards, and design elements that promote safety. After hearing about the video system in Natick, he said, he wanted to explore that as well. Some communities are looking to renovate, not build new, with similar goals in mind. In Sharon, officials have begun talking about reconfiguring an elementary school to eliminate its rotunda-like entrance and route visitors through the main office, School Committee chairwoman Veronica Wiseman said. Architect John Nunnari, executive director of the Massachusetts chapter of the American Institute of Architects, was part of a working group formed by the Massachusetts School Building Authority to address security in school design after the Newtown shooting. The group was later absorbed by the governor’s task force. He said much of what communities do with their buildings — whether to use bulletproof glass, say, or remotely locking doors — comes down to money. The task force report repeatedly says that state or local officials should allocate funds for various security initiatives. To date, the only new statewide funding comes in the form of a $200,000 grant program to give communities what Malone called “seed money” to leverage local investment or cover relatively small costs — door locks and the like.